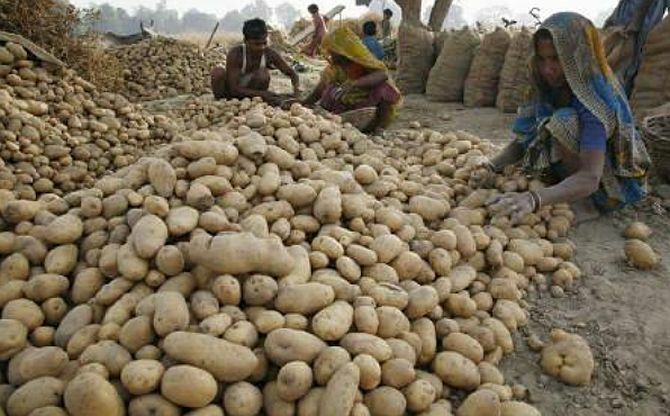 Election is in the plate and political parties and candidates are running election campaigning at a breakneck speed.Although there is no one to stand up for the problems potato farmers are facing now.From output surge to lack of cold storage, all odds are against those fellow farmers. The central government has yet to take a single step on the crisis.Farmers are urging that the government should take a deem the matter urgently. When I had forayed into the cold storage business in 1998, the retail price of potato in Uttar Pradesh was around Rs 20 a kg. Even though Potato sees record production year after year but falling realisation for farmers,the price for the potatoes are lower than ever. “These are still around the same level and sometimes lower,” says Agra-based Rajesh Goyal, acting president of the Federation of Cold Storage Associations of India. Many a time, farmers do not bother to even come to a cold storage to take delivery of their commodity, since the transport cost would be steeper than what the produce would fetch in the wholesale market. “The easiest way to support growers is to promote the export market, by cultivating varieties in demand in the key markets of Europe, Russia, etc,” says Indian Horticulture Exporters’ Association president Ajit Shah. He says there has been no government action on their earlier suggestions. For instance, he says, Russia is a big potato buyer. However, “it requires a certificate from the country of origin that the consignment is free from contamination and was grown in a contamination-free environment. “This certification is not being provided by the Indian authorities, when we could export 50,000 tonnes a year to Russia,” he says. BJP’s vote bank UP contributes nearly 34% of potato production and 24% by Bengal in the country,followed by Bihar and Gujarat at 15 and seven per cent. In 2018-19, production was estimated at 52 million tonnes (mt) and consumption at 32 mt.The current season is again expected to see over-production.Apart from the low prices, the storage facilities are already full is another important matter for concern, say growers.